Augmented reality startup Nreal was a hit at this month's CES event, with some even calling the device a worthy challenger to the Magic Leap One. However, the company's path to success in the US may not be as smooth as it first seemed, as gaming giant Epic Games has lodged a legal challenge that could ground the AR upstart before it even takes off. 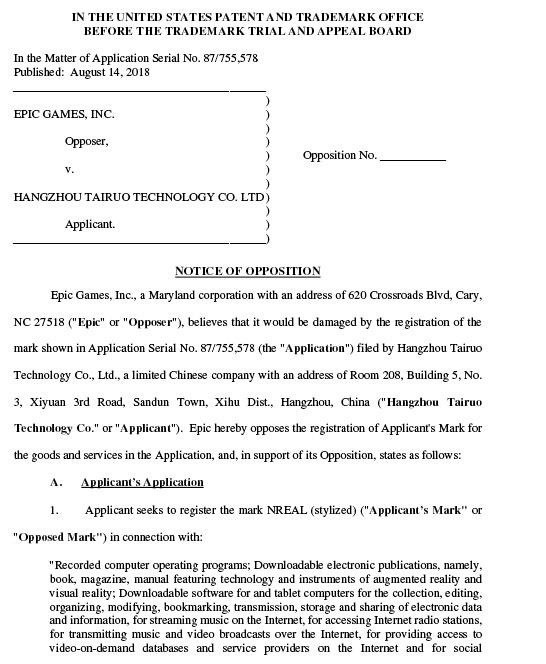 In a opposition filing entered in August of 2018 with the US Patent and Trademark Office (USPTO), Epic Games, the company behind the Unreal Engine (which many developers use to create AR and VR experiences), as well as gaming hits like Fortnite and Gears of War, is challenging Nreal's right to use the name as a trademark for its wearable AR system in the US. Now, after months of silence, Nreal, has finally responded to the challenge from Epic Games via its own legal filing with the USPTO. For its part, Epic Games' challenge to Nreal's Jan. 2018 trademark application lays out its case against the startup pretty clearly. "'NREAL' and 'UNREAL' are highly similar from a visual perspective. The only difference in spelling—that the Applicant's Mark lacks a single vowel contained in Opposer's UNREAL Marks—does not sufficiently distinguish the appearance of the Applicant's Mark from that of Opposer's UNREAL Marks," reads the filing from Epic Games. "Applicant's Services include 'design and development of computer game software and virtual reality software' and 'computer programming,' which are closely related to Opposer's Goods related to software used for development of video games and virtual and augmented reality software." Despite this challenge, Nreal, represented by its parent company Hangzhou Tairuo Technology, isn't backing down. The answer to Epic Games, filed on Jan. 21, disputes any claims of similarities or confusion. 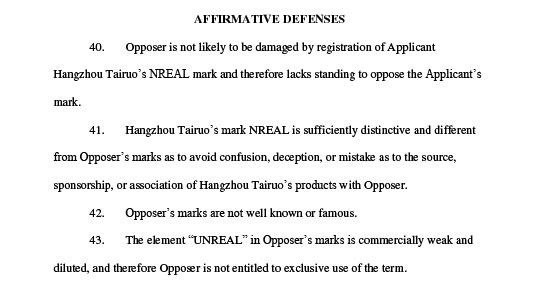 "Opposer [Epic Games] is not likely to be damaged by registration of Applicant Hangzhou Tairuo's NREAL mark and therefore lacks standing to oppose the Applicant's mark," reads the response from Nreal's team. "Hangzhou Tairuo's mark NREAL is sufficiently distinctive and different from Opposer's marks as to avoid confusion, deception, or mistake as to the source, sponsorship, or association of Hangzhou Tairuo's products with Opposer." But it's the next passage from Nreal that strains credulity, and indicates that this may become a rather contentious legal fight. "Opposer's [Epic Games] marks are not well known or famous. The element 'UNREAL' in Opposer's marks is commercially weak and diluted, and therefore Opposer is not entitled to exclusive use of the term," the NReal response continues. "Upon information and belief, the trade channels in which both parties sell their products consist of sales to sophisticated purchasers who make considered purchasing decisions and are unlikely to be confused." Epic Games' marks are not well known or famous. The element 'Unreal' ... is commercially weak and diluted, and therefore Opposer is not entitled to exclusive use of the term. Legal jargon and standard trademark wrangling aside, Nreal arguing that Epic Games' Unreal Engine name isn't famous and is "commercially weak" isn't likely to lower the temperature in this legal skirmish. And if Nreal was led by a tiny, bootstrapped team, that might be the end of the story, with Epic Games winning by virtue of its sheer size and resources. But it turns out that Nreal's backstory isn't that simple, or fragile. Based in Beijing, China, Nreal was co-founded by Dr. Xu Chi, who worked at Magic Leap as a software engineer from 2015 to 2016, and just before that worked as a GPU architecture intern at Nvidia while completing his doctorate in computer engineering at the University of Minnesota (he earned his undergraduate degree in the same concentration at Zhejiang University in China). After a stint a Magic Leap, in 2017, Xu and his team raised startup funds from investors Shunwei Capital and Aplus Capital (aka Hongtai Capital Holdings) to the tune of about $15 million. Why are those backers important? Well, Shunwei Capital, which manages a $3 billion fund, is also one of the major investors in smartphone powerhouse Xiaomi, as well as online video giant iQiyi. Translation: Nreal is no pushover, it has powerful forces backing it up. The next move for both companies, according to a spokesperson from the USPTO, is to enter a six month discovery period during which they'll exchange information and attempt to either settle and dismiss the case, or eventually present all findings to the Trademark Trial and Appeal Board for a final decision. In some cases, the proceedings could take years. But this current legal tussle doesn't technically prevent Nreal from using the Nreal name in the US. Although, if Nreal does roll its product out on US shores under the Nreal name and, subsequently, the startup loses to Epic Games, there could be a monetary damages case filed in another court in the future. And before you look at this as a well-funded David (Nreal) versus an overly litigious Goliath, it's worth taking a moment to seriously consider the claims in Epic Games' opposition filing. Both companies are in the AR space, so the pronunciation and branding dynamics of both could get confusing for some. 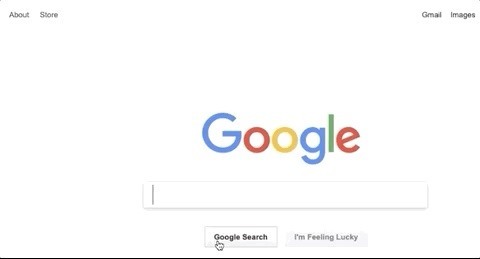 Furthermore, a quick Google search lends a bit more heft to Epic Games' claim. Search for "Nreal + HoloLens" and Google asks if you mean "Unreal + HoloLens." The same happens when you replace HoloLens and Magic Leap. Seen in that context, Epic Games' claim doesn't seem so frivolous. Nevertheless, Nreal has yet to even announce a for-sale date for its Nreal Light device, so the legal implications of its potential sale in the US aren't even in consideration at this point. Still, if the positive reactions to the Nreal Light at CES were any indication, Nreal has a lot of incentive to gets its product into the hands of US consumers as soon as possible, whether Epic Games likes it or not.